The first two installments of this series have only used Lego train track pieces officially offered by the Lego company. We observed several times that the geometry of these pieces can be limiting to those who want more realistic trains or more complicated layouts. For this reason, a small industry of third-party manufacturers has appeared in recent years. Companies such as 4DBrix, TrixBrix, and BrickTracks are offering 3D-printed and/or injection-molded wider-radius curves, modified switches, and other pieces of custom Lego train track. But what does all this mean to the beginner? Are these pieces worth buying if you're just starting out? Let's cover the possibilities that all these custom track pieces unlock, so you, the reader, will have the information to decide for yourself! DISCLAIMER: Some Lego enthusiasts are "purists" in the sense that they refuse to acknowledge, much less use, third-party pieces, nor are they willing to modify existing Lego parts. My viewpoint is this: companies that directly copy Lego designs, produce them in a lower quality and sell them as competition to Lego are bad. Companies that produce parts that Lego themselves do not manufacture (including track pieces, weapons, stickers and printed bricks, etc) that enhance and add to the official product line are acceptable. If you consider yourself a hard-and-fast purist, this article may be worth skimming, but otherwise, we'll see you in the next post in the series! When we talk about the Radius of a curve, we are referring to the distance from the middle of the track to the center of the theoretical circle created by that section of curved track. That is, the term "radius" applies to all curved track, not simply track that has formed a complete circle. The standard Lego curve track has a radius of 40 studs, commonly referred to as R40 for "Radius: 40." The image below shows how the radius is measured in bricks, or studs. The distance from the center of the circle of track to the center of the rails is 40 studs, measured by the orange and blue 4-stud long bricks. While this tight curvature is handy for building a complete loop of track in a relatively small space (relatively small compared to other large-scale model trains, that is), the small radius is A: not very realistic, and 2: doesn't allow for longer rolling stock. Official Lego trains are almost always under 32 studs long (the length of two pieces of track) which means the engines and cars are usually far too short to look prototypical. There is some discussion over the exact scale proportions of Lego, but some generally accepted standards amount to 1:38 proportion, as well as "1 stud = 7/10ths of a foot." This is why many serious model builders create 7-stud-wide or 8-stud-wide trains, because it is a more realistic proportion to the 6-stud track gauge. Point being, a modern American passenger coach is 85 feet (or 26 meters) long. A Lego model of such a car could be 60 studs long or more. This would look ridiculous on an R40 curve, and in fact, may not even traverse such a tight corner without binding or derailing. Enter the wide-radius curve! This image, created using the BlueBrick software, shows a half-circle made of standard Lego curves in the center, surrounded by half-circles made up of wider-radius curves. The number after the "R" refers to the radius of each curve, measured in studs. Not shown are R120 curves. 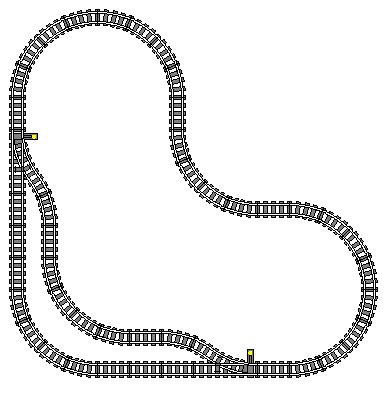 The size of each individual piece of curved track is shown in the lower right. For comparison, the radius of 40 is equivalent to 12.6 inches, or 32 cm. The radius of 104 is equivalent to 32.8 inches or 83.2 cm. Remember that the radius is measured from the center of the rails, not the inside or outside edge of the curve! Lego User Groups, Lego Train Clubs, and other Lego Train enthusiasts who build larger models can be seen utilizing wider-radius curves for their public display layouts. The upshot is that the realistic-length rolling stock looks better and runs smoother on the large curves. The disadvantage is the amount of space they take up. To a beginning Lego Train fan, these curves may not seem useful, but here are two applications I can think of that may entice the novice layout builder. Oh, and full disclosure: I do not currently own any wide-radius curves myself. They're on the shopping list, but they're low-priority. In this image, we see a quarter-turn of R88 curves on the left, and a quarter-turn of R40 curves on the right. The R40 design uses six straight pieces to fit the same space as the R88 curves. Using R88s in this instance would provide a gentler curve for the trains, as well as saving on straight track; a valuable resource! 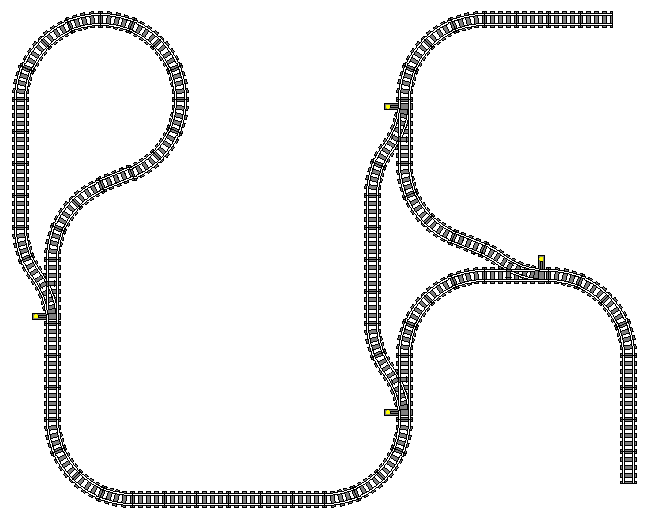 The outer loop of this double-track layout uses R56 curves on the left side of the plan. On the right, both inside and outside loops use R40 curves. Note that the right side of the layout requires four more straight tracks to fit the outer loop curves around the inner loop. One might also argue that the curves on the left side of the layout are more aesthetically pleasing. Although we won't explore their application in this article, it's also worth pointing out the existence of "grand curves," which are made by using straight track pieces with one side of the connection spaced half a stud apart. The effective radius of a grand curve is 238 studs (6.25 feet, or 1.9 meters); most likely far too wide for the casual hobbyist, but very enticing to clubs displaying at Expo centers with plenty of space to build such large corners. Shown above, across the top, are four types of custom Lego switches. On the left is a standard switch with the oblique diverging route, which accommodates connecting a curved piece to create two parallel tracks, as shown in the lower right. The next switch over on the top row is typically called a "half-curve" switch. The diverging route has been cut off with part of a piece of curved track glued on to replace it, which means the diverging route equals two R40 curves. Add two more R40 curves as shown below it, and you have a 90-degree turn without having to use extra curves or straights to accommodate the oblique diverging route of a standard switch! Third from the left on the top row is a "crossover" switch. Consisting of two sets of points connected at their diverging route, this piece functions the same as the crossover discussed in the previous installment of this blog, however it takes up far less space, as shown in the lower right of the image. Finally, we have a stub-end switch, which can be used as any type of custom switch, depending on what sort of custom track pieces you attach to the diverging route. With the advent of the plastic track, it is actually fairly easy to cut and glue your own custom switches at home. This process is more difficult with metal-rail 9V track, and to my knowledge has rarely been attempted with older styles of track. I may put up a set of instructions for creating your own custom switches in a future workshop blog post. For now, I will caution the beginning user against cutting and gluing their own custom switches UNLESS 1: you have enough switches that you can afford to sacrifice one or two to turn into a custom switch (I would recommend having at least two pairs of standard switches in addition to any custom switches you may buy or build), or B: you are 100% certain that you need this custom switch piece in your limited track collection. Some third-party manufacturers have released these types of custom switches with the "throw" mechanism on the outside of the track, or the opposite side from the diverging route, which some builders may find desirable depending on how their layouts fit together. In addition to the custom-cut switches shown above, one can find wide-radius switches as well as "wye" switches or three-way switches. Check out the manufacturer websites linked at the beginning of this article for more information. We'll cover some more example uses of these custom switches at the end. For what it's worth, Lego DID manufacture a double-crossover switch, set number 7996, for a couple of years at the beginning of the current plastic-track era. While appearing novel at first, it was a considerable flop. Most families (read: the demographic with the strongest Lego purchasing power) weren't buying enough track to justify the need of such a specific-use piece in the first place, and because the two sets of points at each end shared a yellow switch throw, it was impossible to set both routes for the "straight" direction. This meant that you could not use this piece to connect two loops and have them operate independently; one set of points would be set for the diverging route whether you liked it or not. Third-party manufacturers have since released more versatile and less expensive versions(available listings for set 7996 are priced well past $100 USD on reseller sites) of this switch style. While the advent of the flexible track section (4-studs long, equivalent to a quarter-length of a standard Lego track piece) has made half-pieces somewhat obsolete, builders in 9 Volt and other systems may find that cutting a piece of track in half comes in handy for certain track arrangements, or perhaps turning a stub-end custom-cut switch into a half-curve or crossover. No, not grade crossings, where the railway meets a roadway; two train tracks crossing each other! 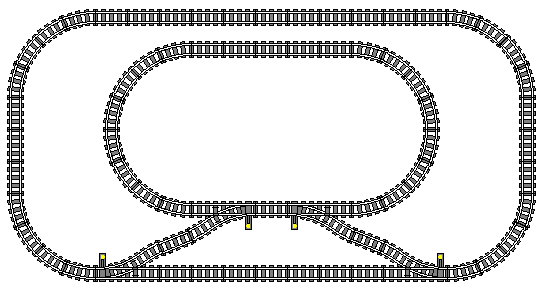 In previous lines of Lego Trains (read: 9V, 12V and 4.5V) the Lego Company offered 90-degree crossing tracks, as shown below. While no official product has been released for the new plastic track, one can find crossing tracks made by the third-party manufacturers listed at the beginning of this article, or sometimes homemade versions on sites like eBay. Note that this 9 Volt 90-degree crossing track is the equivalent of a 16-stud straight track piece for both routes. Now that we've established a larger toy box of potential parts, let's put some of these custom track sections to use in a handful of example layouts! 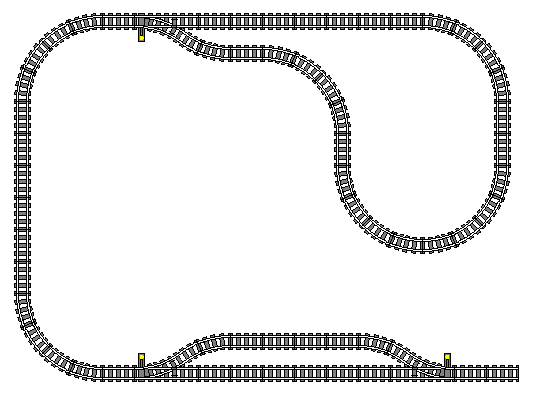 Because my preferred program "Track Designer" does not easily support wide-radius curves, some of these layouts have been designed using the BlueBrick software. If you haven't read the first two installments in this series, they can be found by scrolling down through my Workshop Blog page or Archive page. If you'd like to be notified of when future installments in this series are posted, please follow me on my Facebook page or Instagram account. As always, thank you for reading! *disclaimer: this is more of an editorial/opinion/musing piece than a “how I built this thing” kind of post; I just felt this section of my website was the best place to post it. Earlier this year, I picked up the latest edition of Model Railroad Planning; an annual publication produced by the staff of Model Railroader magazine that focuses specifically on planning model train layouts, one of my favorite aspects of the hobby. Among the articles was a piece written by a professional layout builder who designed and built a layout for a friend. This friend enjoyed building and running models of trains, but had little interest in the act of constructing the layout itself, much less planning the layout beforehand. However, his main reason for hiring a professional layout builder was his own profession: He was a surgeon, and as such, his time for hobbies was fairly limited. Another article I read online some time ago explained how when people start earning higher income, they start “buying back” their time. This usually means hiring a lawn mowing service, or a maid, or perhaps having groceries delivered to their home instead of going to the store themselves. The reasoning is that their time is more valuable, literally. To a person earning $100 an hour, paying someone else to mow the lawn is simply more efficient than doing it themselves. To this surgeon who wanted a model railroad, it was a more effective use of his resources (time and money) to hire someone to not only build the layout for him, but use their knowledge and experience to build it right the first time, as well fit the layout to the surgeon’s needs and desires. This is as opposed to the surgeon using his precious time to learn to build his own layout, surely making mistakes and having to do things over again in the process. This concept of limited time for hobbies really stuck with me. The surgeon’s approach made me think about how I’m allotting resources for my hobbies of Lego building and railfanning. Over the past few months, I’ve been evaluating the way I use my limited time to enjoy my creative pursuits, seeking to ensure that I’m getting the most of what I want from the activities I occupy my free time with. Below are some of my observations on the topic; I share them with the hope that I might spark conversation or self-reflection on the matter for other hobbyists (not just fellow railroad nuts!) so that we all might get the most out of our limited hobby resources. Railfanning takes time. The actual act of capturing a train on pixels as it passes you doesn’t take long, only a few minutes in most cases… but there’s downtime while waiting in between trains. It takes time to drive to and from trackside locations, time is spent planning trips looking for good places to see trains, and time is spent editing and sharing photographs and videos after the trip. It also costs money. Money is spent on camera equipment; money is spent on food and gas, vehicle maintenance, toll roads, and hotels. Money is spent on museum admissions or train ride tickets, and those train rides take time! In May of this year, I drove approximately 3.5 hours (7 hours round trip) to Tyrone, PA, to do some railfanning. After driving up Saturday morning, I spent a few hours trackside, stayed overnight in a hotel, and then spent some more time watching trains before departing for home on Sunday afternoon. I caught nearly 30 trains in about 12 hours trackside, and produced a fair number of images I was quite pleased with. I consider this a good use of my time; the drive was a little far, and the hotel stay did cost a few pennies, but I feel that the results were worth the driving time and expense. On the flip side of the coin, one finds my experience from a recent Saturday: driving 4.5 hours (9 hours round trip) to BrickFest Live at the Meadowlands Expo Center in New Jersey, only to be disappointed by the event and spending less than an hour there when I expected to spend at least two or three. I don’t feel it would behoove me to speak ill of the event, but the bottom line is that BrickFest Live is aimed at children, not adults. There were less than a dozen AFOLs displaying their creations, the rest of the event was mostly building areas and games mobbed with kids. Granted, if I was 7, huge piles of Lego that I was encouraged to play with would be a dream come true. However, I am 27, and I have a much better (organized!) selection of bricks at home, and my workshop isn’t crowded with shouting children. I did see a dope castle, had a nice conversation with a man about his well-built boats, and I spent about $18 on parts just to feel like I got something out of the trip... but overall I wasn’t very entertained. My intention was to attend a Lego expo as a member of the general public rather than a registered exhibitor, and enjoy seeing hundreds of brilliant creations made by my fellow Adult Fans of Lego without having to worry about my own display. If the event website had been clearer about the nature of the event, I would have spent all that time staying at home and doing something more productive and enjoyable with my hobby. Now, certainly it’s a bit easier to see the balance of resources when it comes to traveling, but what about hobby time spent at home? At BrickFair Virginia in 2017, I was approached by a sales rep for a company that ships out “build challenges” to their subscribers each month. He asked that I try their service from an adult perspective (most of their customers are families with children) to see how I liked it. Each month’s box contains a pamphlet with a story that ties all the build challenges together; you have to create your character for the story and build the various scenes and props using the Lego pieces provided in the box to bring the scenario to life. Once you’ve finished your creations as prescribed by the narrative (no step-by-step instructions, just general prompts like “build a museum for your minifig to film a movie in!”) you’re meant to upload pictures of each of your builds to the company’s Facebook group, so all the participants can see what others have built and win prizes for the best builds. I don’t care much for the story or the make-believe, and I found that the social media demands from the box (read: receiving endless notifications about the hundreds of other posts in each thread) weren’t enjoyable at all. The part I DO like is that the build challenges test my creativity and open my mind to new possibilities. Plus, receiving a box of random Lego parts each month is quite alright! As part of my agreement to test their service, I offered to post a YouTube vlog of me trying out my first box. Filming the vlog was reasonably fun, despite having to do multiple takes of each segment, but editing the vlog proved to be far too much of a chore for my liking. Editing videos of trains is less time-consuming, and although I don’t concern myself with the analytics of YouTube, the train videos I have posted gain views far more easily than my two vlogs, which I have since taken down. I recognize from successful vloggers that it takes time and effort to build an audience, to create content that people want to watch and then gathering and keeping people who want to watch it; this is time and effort I’m not interested in spending. The same issue applies to my workshop blog as a whole: I enjoy building things and sharing pictures and videos of them with the internet, but writing up a storm about HOW I built them, remembering to take step-by-step pictures, and then assembling it all into a blog takes time and effort. Instead I’ve found that I prefer to lose myself in the creative process, *then* share the final product on social media to talk about my creation with others… and bask in the psychological validation of likes and comments. Why should I spend my limited hobby resources on creating content that doesn’t bring me much satisfaction, especially when this content doesn’t rake in the psychological validation (likes and comments) as easily as the content I DO enjoy producing? While I haven’t finished scrutinizing how I utilize my hobby time, I have already made some changes to get a better ROI from the resources I put in; I stopped pursuing a vlog because creating one wasn’t enough enjoyment, I focus on sharing finished products on limited social media outlets to curate a desirable quantity of psychological validation, and when I put in seemingly “wasted” time, I pursue a more valuable outcome to ensure that the downtime was worth the uptime. Yes, I spent two hours standing by the train tracks, but the train that eventually came by was worth the wait. Yes, I traveled a long way to an event that failed to meet my expectations, but at least I acquired some useful parts and had a pleasant drive. Point being, we all have limited resources to put into our hobbies. It’s easy to see how far your money goes, but it’s not as easy to see how far your time goes. A simpler example to draw might be the difference between making dinner and ordering takeout. Making dinner could take, say, 15-30 minutes of your time. Ordering dinner takes less than 5 (we’re not counting the time spent eating, of course) but does the cost of doing so outweigh the value of the time gained back? Putting the question back in Lego terms, one might look at parts sorting. Personally I enjoy it, but many Lego enthusiasts do not. Sorting and organizing a Lego parts collection takes a lot of time (not to mention money spent on a wide variety of parts storage containers) but I say it pays off because not only can you find the piece you need for a build very quickly, but you know exactly how many of that part you have, should you need to order more. While the surgeon wasn't interested in learning to design and build a layout, the time spent planning a layout is something I take great pleasure in. What time is worth investing in your hobby? In the first installment of this series, I mentioned a couple of times that the track geometry of Lego Trains is unique from most other model trains, and sometimes very limiting. Let's delve further into what the phrase "track geometry" means. There are five pieces available directly from Lego for your train track needs: a 16-stud straight piece, a 16-stud curved piece with a radius of 40 studs (measured from the center of the track), a left and a right switch (~32 studs long each), and the 4-stud-long flex track piece. The rails are spaced six studs apart, with an extra stud on the ties, to make each track section 8 studs wide. Switches are of course, wider, but the dimensions of the individual routes are still 8 studs wide. This photograph shows the whole range of official Lego train track parts. On the far left is a standard curve, and on the far right is a standard straight. 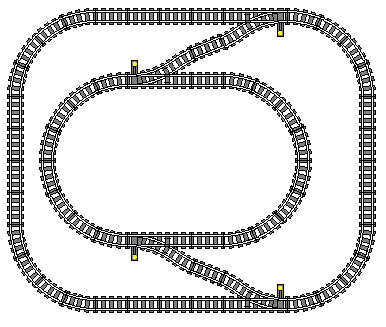 The bottom center shows one piece of flexible track, and the top center shows four pieces of flexible track connected together, equaling the length of the curve and straight track, but with the ability to shift into unusual shapes. Also shown is one left-hand switch (set for the diverging route) and one right-hand switch (set for the straight route). 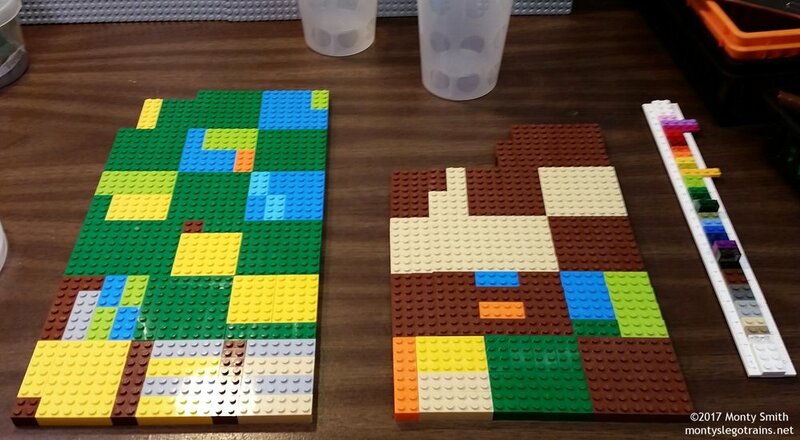 On the left, a full circle of 16 straight tracks fits on a grid of 5"x5" squares, or 16x16-stud baseplates, for a total of 30"x30". In the top center, a piece of straight track fits on a 16x16 stud square baseplate, with a 4-stud margin on either side. On the top right, a 180-degree turn of 8 curved tracks is the same width as three 32x32 stud (10"x10" or 25.4x25.4cm) baseplates, but we need an extra 16 studs vertically to completely cover the ends of the turn. In bottom right, a quarter-turn of curved track fits on a 48x48-stud baseplate (15"x15" or 38.1cmx38.1cm) with a 4 stud margin between the outer edge of the curve and the corner of the baseplate. Finally, a switch with a curved piece splits into two parallel tracks spaced 8 studs apart. The point of all this is that Lego tracks adhere to a grid system, which can make planning a layout very easy. Now that we've established this grid, let's look at a few track arrangements that do not fit on the grid, and some space-saving techniques that DO fit on the grid. 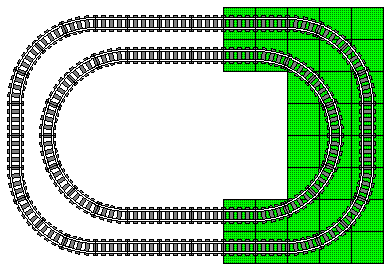 New layout builders may find that their creative arrangements of curved track do not meet up properly when one is trying to close their loop (though the advent of flexible tracks can help alleviate this issue), and this is usually due to a funky arrangement of curves not aligning to the grid. Note that the examples on the left and right come close, and possibly a piece of flex track or two may help slightly, but the arrangement in the center will not work on the grid at all. It is also worth pointing out at this time that model trains generally do not like opposite-direction curves back-to-back (these are defined as S curves, as they resemble the shape of the letter). Some of the Lego Train sets can handle it, but heavier pieces of rolling stock (read: most MOCs) will bind on the curves or possibly derail. If you're going to put curves in opposite directions in a row, it's best to put a piece of straight track in between them, or at least a couple of sections of flexible track. In the first example, a piece of straight track is placed between the two opposing-direction curves. A good practice. In the second example, there is no straight track between the opposing-direction curves. This could cause a derailment. 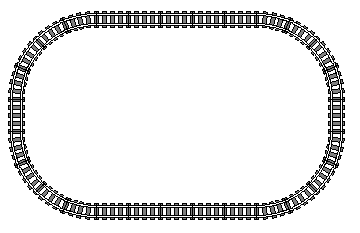 In the last example, a piece of straight track has been substituted for the spot where the two curved tracks met, so each curve section is only three curved tracks long. We've also managed to save 32 studs (10" or 25.4cm) of vertical space by shortening this S-curve. We see in the first example a straight piece in between the two opposing-direction curves. The second example shows no straight piece and therefore an undesirable S-curve, and the third example has an even worse S curve by putting an opposite-direction curved piece right after the switch. A couple lengths of flex tracks could potentially align the track back to the grid, but the S curve between the switch and curved piece could cause a derailment. The fourth example shows a straight piece in place of the two curves, saving us some space and still aligning to the grid. We don't need the grid to see just how much space was saved by the one-straight-for-two-curves trick! Let's look at one more example of the application of this track trick before we apply our knowledge to layout planning. In the first installment of this series, we only looked at single-track railroads, or track plans with only one main route. If one wants to run multiple trains at once without interference, it is advised to have two independent loops of track, or loops that do not share any portion of their route. These two circles of track are completely independent from one another. The grid is provided for convenience. While having two independent loops for running trains is nice, one might wish to switch a train from the inner loop to the outer loop, or perhaps interchange some cars between the trains on each loop. This is where a "crossover" comes in. 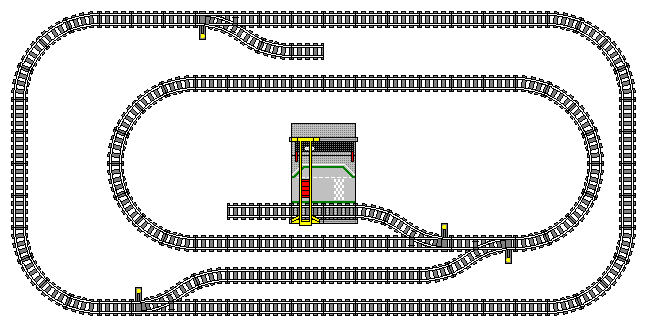 A crossover is a pair of switches linking two independent sections of track. In this photograph from Pittsburgh, PA, we can see two crossovers directly in the shadow of the bridge, linking the outer tracks with the inner tracks. The train is rolling over two more crossovers linking the inner two tracks, and beyond that we can see two more crossovers linking the inner tracks with the outer tracks in the opposite direction. We COULD simply link the two diverging routes of our switches and connect our independent loops that way, but once again, our layout wouldn't perfectly conform to the grid. 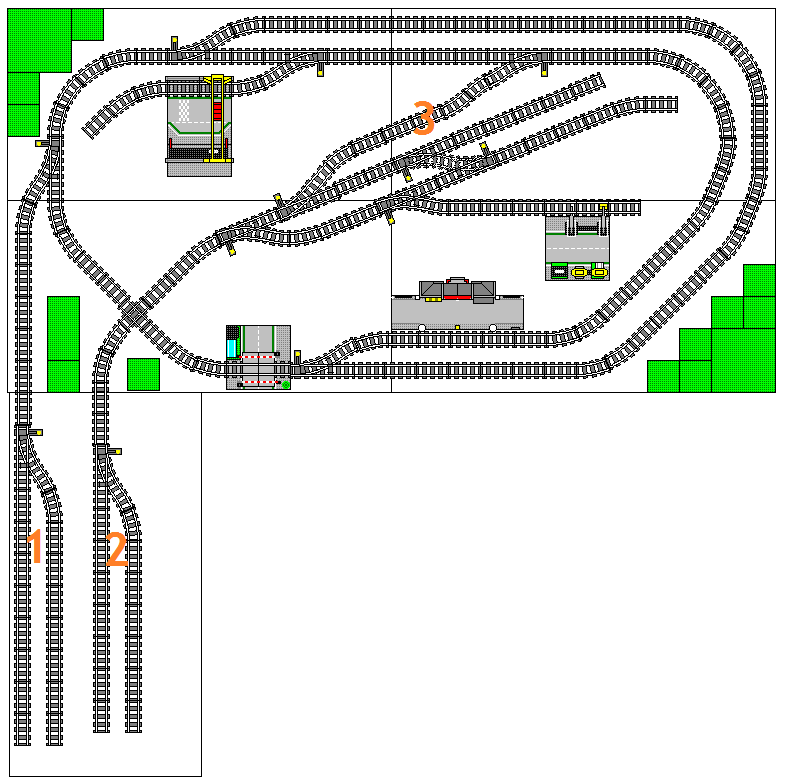 Better to use two curved tracks (one for each switch, so the diverging route becomes parallel to the main route) with a straight track in between, or just one straight track to link those two switches and conform our layout to the grid. 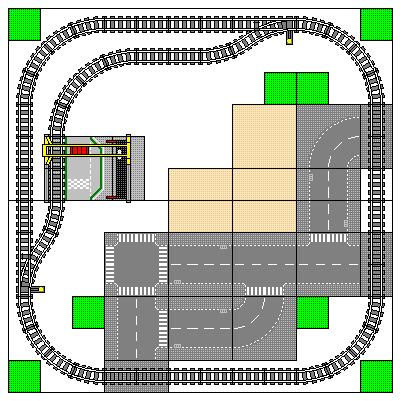 The first example is what NOT to do: because the diverging routes of the switches are oblique without curved tracks to complement them, the outer loop of this layout is completely misaligned from the grid, and the outer track is too close to the inner track along the top of the plan. In the second and third examples, a properly aligned crossover (either with two curves and a straight, or one straight substituting for two back-to-back curves) means that BOTH loops align perfectly to the grid. Note that in each case, both switches are left-handed switches. Also note that a train traveling clockwise on the outer loop must reverse through the crossover to reach the inner loop, and vice-versa. At this point, one might beg the question: "What's so important about lining up to the grid? Those two independent loops still fit together, even if they're not aligned perfectly to the 5"x 5" (12.7cm x 12.7cm) grid! What's stopping me from building something like that?" The short answer is: nothing! If you're able to make a track layout work without aligning your tracks to the grid, more power to you! If you're just building tracks all over the living room floor for an afternoon of fun, then the grid doesn't concern you all that much, and most of the information thus far is simply to inspire ideas and help troubleshoot derailments and other minor issues. The point of the grid is that it's an easy reference point to ensure all tracks will fit together, AND, as we will see in future installments of this layout planning series, aligning to the grid makes it easier to lay out streets and buildings alongside our tracks. We will look at one more type of railroad track arrangement and how we can use our straight-track-for-two-curved-tracks space-saving technique to make it easier, but first, here are a few more examples of crossovers between tracks. We will drop the grid from the example images for the moment. This satellite photo shows the wye at Grand Junction Station. A train enters from the lower left, and pulls up to the station along the top-left leg of the wye. After the passengers are loaded, the train pulls forward of the switch at the top center of the photo, then reverses along the curved track obscured by trees. The tail track in the lower right is just barely long enough to fit a locomotive and three passenger cars. Once the train is clear of the switch adjacent to the road crossing, it pulls forward along the lower leg of the wye, past the sidings of equipment on display, and returns to the track it came from in the lower left, now traveling in the opposite direction. The first example shows the basic properties of building a wye in Lego, and the second two examples show the use of the straight-for-curve trick. 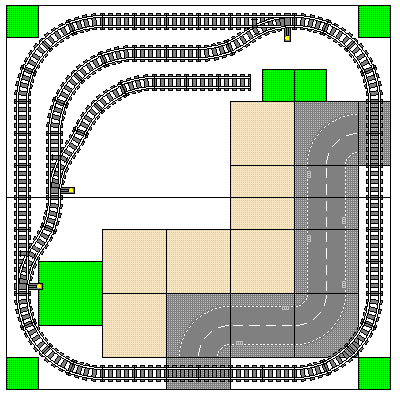 We'll close part 2 of our Lego Train Track Planning series with a few examples of layouts using wyes. If you would like to be notified when the next installment of this series is posted, please follow my Facebook page or my Instagram feed. Thanks for reading! A question that pops up in the Lego Train hobby community somewhat frequently is interpreted as follows: "I've amassed a fair collection of Lego Train track pieces beyond what comes in the basic train set; how do I know what I can build with it all?" I see a few different ways this question can be answered. Option 1: Do what my engineering professor did when I asked him about a simple printing key-command shortcut, which was to hand me a 2400 page AutoCAD manual and say "Look it up." Alas, the "figure it out yourself" approach isn't very friendly, and may turn some people off from the hobby due to the overwhelming amount of information available about planning model train tracks. Option 2 would be to set up a side business where I design layouts for people based on their track quantities and available space (a common theme of the above question is whether a software exists that will perform this action automatically. No, such software does not exist). However, this would turn play into work for me, and create a pile of client relationships I'd have difficulty maintaining. 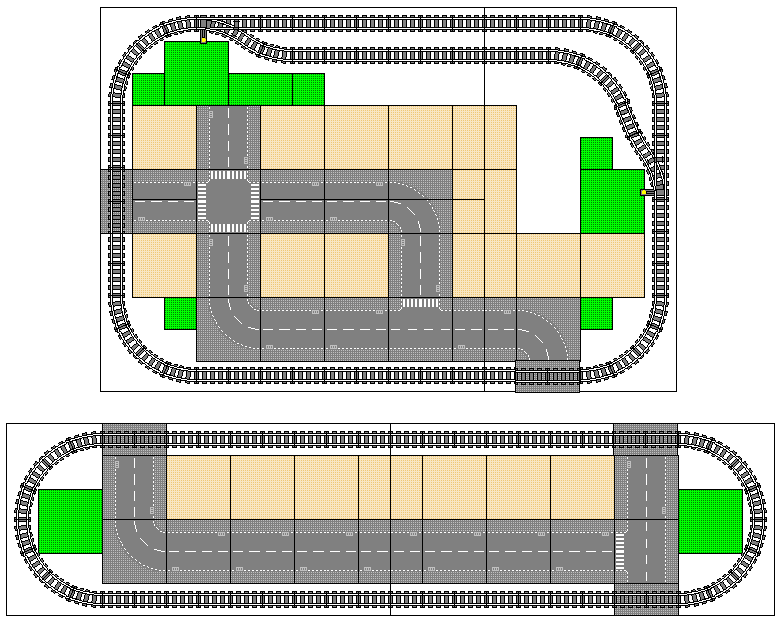 So, I'm going with Option 3: Demonstrate the fundamentals of planning model train layouts using Lego train tracks. My primary source of income is education, so teaching others to design their own layouts seems like the best approach for me to take. Track Planning at its core is the act of designing your model train layout before you build it, one of my favorite aspects of the hobby. Countless articles and books are available on the subject, but the information is usually aimed at model railroaders in conventional scales. This plethora of planning knowledge can be a bit inaccessible for beginners, especially those working in L gauge, which presents its own unique set of geometric challenges not found in most other scales. Many builders new to the hobby will simply lay out track until they run out of pieces (potentially leaving their idea incomplete) and they may find certain track arrangements don't fit perfectly or can cause derailments. Planning your track beforehand gives you the luxury of making mistakes on paper (or pixels), rather than in the physical world where such errors can be more disheartening than something that simply needs to be erased and re-drawn. 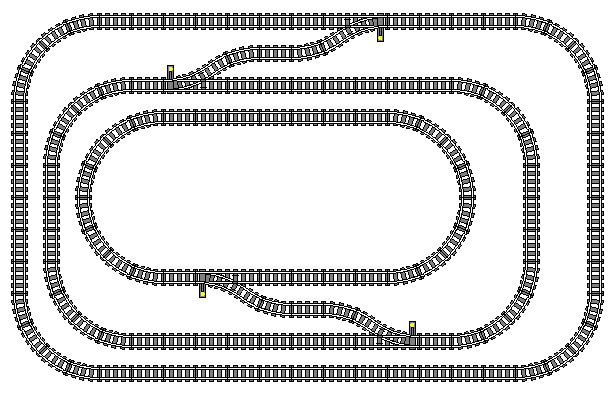 Throughout this series, I will be drawing layout plans using Track Designer, a Windows 95 program written during the 9 Volt era of Lego trains, which is not easily found available for download these days. As such, for newcomers to the track planning realm, I would recommend the software BlueBrick, which is more recently updated and has more advanced features than Track Designer. That said, even if you don't prefer to draw your track plans before you build them, the data I am presenting will still help you come up with functional, creative track plans for your Lego train collection. This will be a multi-part blog series, and to start, let's cover some of the fundamentals of Lego Train Track Planning, beginning with... the circle! Note that a 90-degree quarter-turn requires four pieces of curved track, and a 180-degree half-turn requires eight pieces of curved track. Next, let's pick up a box of extra tracks from our nearest Lego supplier. This box has eight pieces of straight track, four pieces of curved track, and eight pieces of flex track. For the purposes of this article, we will mostly ignore the flexible track, but it's worth noting that four pieces of flex track can substitute for a straight OR a curve piece. In the center of the picture is one length of flextrack. On the left, we see how four sections of flex track can equal a single piece of curved track. On the right, four sections of flex track equal one straight track as well. The red plates help keep the sections of flex track perfectly straight. With our extra track, we can now build a much larger oval. 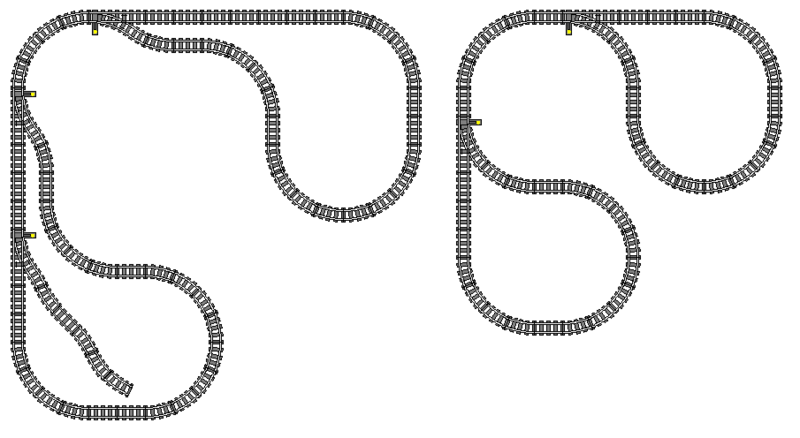 This layout uses 12 pieces of straight track (five each on the long sides and one each on the short sides) and 16 pieces of curved track. The layout covers approximately 35"x55" (89cm x 140cm) of space, and gives us a longer run for our train. That said, it's a bit boring for operations. Once you've stopped your train at the station a few times and run it as fast as possible in circles until it derails or drains the batteries, there's not a whole lot else to do. Thankfully, the new Power Functions freight train sets sometimes come with switches (in the days of 9 volt trains, switches were only available separately). But before we add switches to our layout, let's talk briefly about the two types of side-tracks we can create with switches. One may assume that the main line track continues beyond the green squiggles at either end. On the left is a passing siding, sometimes called a "passing loop" in non-American railroad slang. This siding has a switch at each end, allowing a train to enter and exit the side track traveling in one direction. It is called a "passing" siding because it is typically found on a single-track railroad at a point where two trains traveling in opposite directions must pass one another. For instance, we could park our freight train heading to the left in the siding, close the switches, and wait for the passenger train heading to the right to go by on the main track. We may also use this siding to park our freight cars and run the engine around to pull the train from the opposite end, a technique that will be studied in further detail another time. 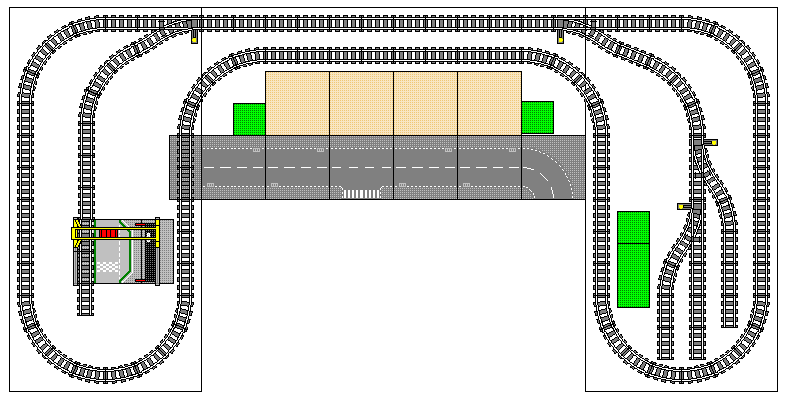 On the right is a stub-end siding; a train may only enter from one end, and then must reverse to return to the main track. This type of siding is typically used to park freight cars for storage, or for loading and unloading at an industrial site. The crane of set 60052 or the container forklift of set 60198 comes to mind. *NOTE* Lego Train switches are spring-style switches. This means that a train coming towards the rightmost switch from the right of the above image (on either the main track or stub-end side track) is able to go through the switch regardless of which direction the switch points are set for. On the other hand, a train traveling in that same direction heading towards the middle switch will be forced onto the route for which the points are set. Also note that if you are using the older, metal-rail 9 Volt tracks, the switches are power-routing. Both outside rails of the switch will always be powered, but the inside rail of the route the switch is NOT set for will NOT have power, which means your 9V motor will remain stationary until you throw the switch. Let's look at a few of layouts that use one or both of these siding types. 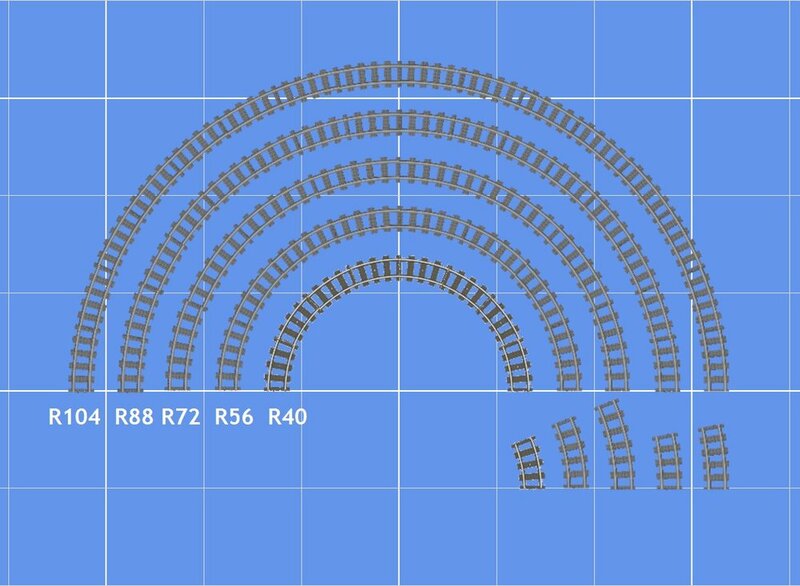 Each of these layouts uses nearly all the track in our collection so far: 16 pieces of curved track, plus one curved track per switch (this allows our diverging route to line up parallel to the main route) and all 12 pieces of straight track (11 on the right-hand layout). So now we have some more operational interest; we can deliver freight cars to the industries at each siding on the left layout, or we could drop off and pick up a freight car on the passing siding on the right layout. However, we're still a bit limited in our abilities; we can't park an entire freight train on the passing siding on the right layout, and if we want to service both sidings on the left layout, we either need to run our train with the engine in the middle of the freight cars, or run the engine all the way around the layout to get to the other end of the train, neither of which are entirely realistic. So, let's drop by our local Lego supplier again, and pick up another box of straight and flexible tracks, as well as 2-pack of extra switches. Note that switches are only available for sale in left-and-right pairs, unless one purchases parts on the secondhand market. 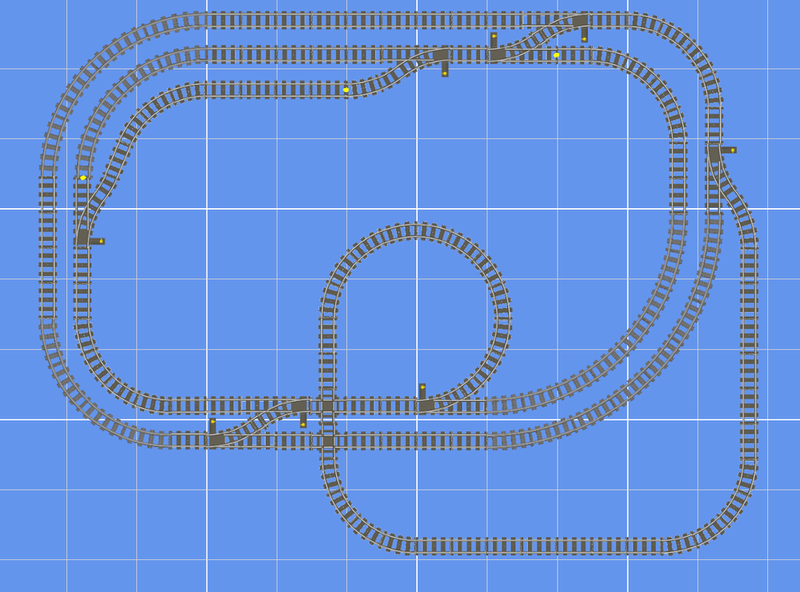 This layout shows 21 pieces of straight track, but so far we only have 20. We can use our flexible tracks to substitute for that extra piece of straight track. 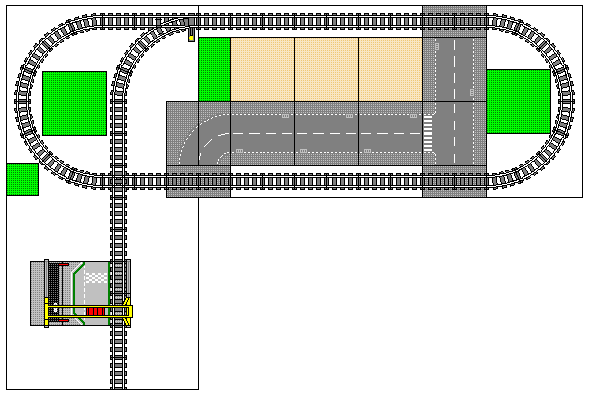 Now we have a layout with some genuine operational interest: A large circle to run our train, a passing siding where we can park a second train, and two sidings where we can deliver and pick up our freight cars. We'll cover operations more thoroughly in another installment of this blog, but for now, let's try out some different layout shapes besides the basic oval. We'll temporarily throw out our track count for the sake of demonstrating the different shapes and options. Click on each layout to see a brief description of its features. There are other shapes and styles of layouts available to model railroaders, but due to the limited track geometry of Lego trains, these options will be covered in another part of this series. We have also focused only on single-track mainline layouts so far, meaning that there is only one route for trains to take to traverse our tracks. Future installments of this blog will cover multi-track layouts and how to operate your trains realistically. To close this first section, we will look at a couple of classic layout shapes designed by the Lego company themselves! The enormous passing loop on the left hand side gives us two route options; a train traveling to the left at the top of the plan may go straight through the switch for a short route, or go through the diverging side and travel the long way around the whole of the layout. Also note the two stub-end sidings; the one on the left is long enough to hold an entire train! 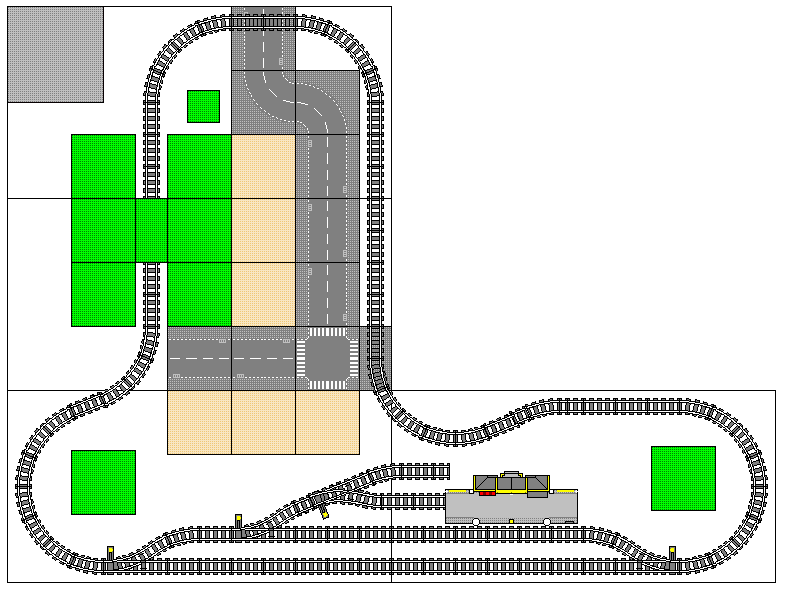 This layout is packed with operational interest: two stub-end sidings, a passing loop in the lower left, and a very long passing loop (which could be considered an alternate mainline route) stretching from the switch at the upper right of the plan, to the switch at the lower right, going around the left side of the layout. The second installment of this blog series covers the geometric properties of Lego Train tracks, as well as double-track railroads and related layout planning elements. If you would like to be notified when future installments of this blog are posted, please follow my Facebook page or Instagram feed. Thanks for reading, and happy layout building! To add a bit more realism to some of my locomotives, I ordered some engraved bricks with road names and numbers. I also ordered some bricks with my social media info to add to my BrickFair name badge. I think they all turned out very well! You can see them applied in the pictures below, and the URL to the brick engraver can be seen in the picture above. My haul from visiting the Raleigh, NC Pick-A-Brick wall in February of this year. On the right you can see how I managed to fit many more bricks into the cups by building them... or DID I fit that many? Ever since my first visit to the Pick-A-Brick wall at the Lego Store, I've been an advocate of building inside the cup. That is, connecting the bricks together to use as much space as possible inside the diagonal-sided cup. But after my most recent visit at the beginning of May, as I was un-sticking around 200 green 4x4 plates from each other, my bloodied and scratched fingers begged the question "Just HOW MUCH more space am I saving by building inside the cup?" After all, building a good cup takes up a fair chunk of time at the store, and even more time at home to unstick all the bricks before sorting and putting them away. Is it really worth all that effort? Time to experiment! I went to the Lego store armed with two large cups (50 cents off your refill!) and a small cup that wasn't going to be part of the experiment. I spent about 15-20 minutes building bricks together in one cup, taking time to fill in the extra space on the sides with vertical bricks, as can be seen in the pictures below. For the other cup, I simply dumped bricks in by the handful, doing nothing to conserve space other than shaking down the cup between handfuls of brick. For the sake of making the experiment simpler, I only used actual bricks, with the smallest pieces being 1x2s. No plates, no slopes, no miniature detail parts like levers or hinges. Once my large cups were ready, I filled the small cup, picked up set 40172 "Iconic Brick Calendar" and headed for home! Upon reaching my workbench, I unpacked each large cup, keeping their parts entirely separate, and arranged the bricks in 8x8 squares for easier counting. By building inside the cup, I managed to fit 266 more studs worth of brick versus the cup where I just dumped bricks in. 1,124 studs worth of brick over 858. That 266 studs works out to 33.25 2x4 bricks. Now, I had used mostly 2x2 bricks in the unbuilt cup because that's what I went to pick up in the first place. So what if I had tried to fill the cup with ONLY 2x4 bricks? To answer this question, I dunked an empty large PAB cup into my drawer of 2x4 bricks, and topped it off until I could just barely close the cup, as Lego store rules dictate. Then I dumped the 2x4 bricks out on the empty table and counted them out. I managed exactly 800 studs worth of brick, or 100 2x4 bricks total. This means I lost out on 40.5 additional 2x4 bricks if I had built inside the cup. So, the first half of the answer is obvious: Yes, building inside the cup does in fact afford you more bricks than if you simply dump the bricks in. The second half of the question is harder to answer: is it worth it? While one wants to insist YES, consider the time. It takes a good 15-20 minutes to build inside a cup, versus 2-4 minutes to simply dump the bricks in. Then it also takes time at home to disconnect all the bricks from each other (my fingers still hurt from unsticking all the green 4x4 plates) before they're ready to be used. Many economists have put forth ways to calculate the value of one's time, but I say simply use the hourly wage you get paid at your job. Let's say you spent an hour total on building and unbuilding two cups worth of bricks (15 minutes to build each one, and 15 minutes to unbuild each one). You acquired 81 more 2x4 bricks by doing this. According to the Pick A Brick website, those 2x4 bricks are worth 20 cents apiece, or $16.20 more of bricks. Measured by volume, you acquired roughly 25% more bricks for the same cost of filling the cup. Is that extra brick volume really worth your time? I say yes, but perhaps others might say no. All-in-all, I fully intend to continue building inside the cup. Even if I'm not gaining THAT much more brick by doing so, it means I get to spend more time at the Lego store among my fellow nerds. Plus, the added fun of building Lego in the first place! After all, isn't that what it's all about? My haul from my first PAB wall visit in May. Across the top you can see the towers I built inside the cups. Look to the bottom, and you'll see I managed to fit some bricks by building the 6x6x1 wall sections into boxes. It's not much, but it's 25 more studs of brick than I would have had otherwise! 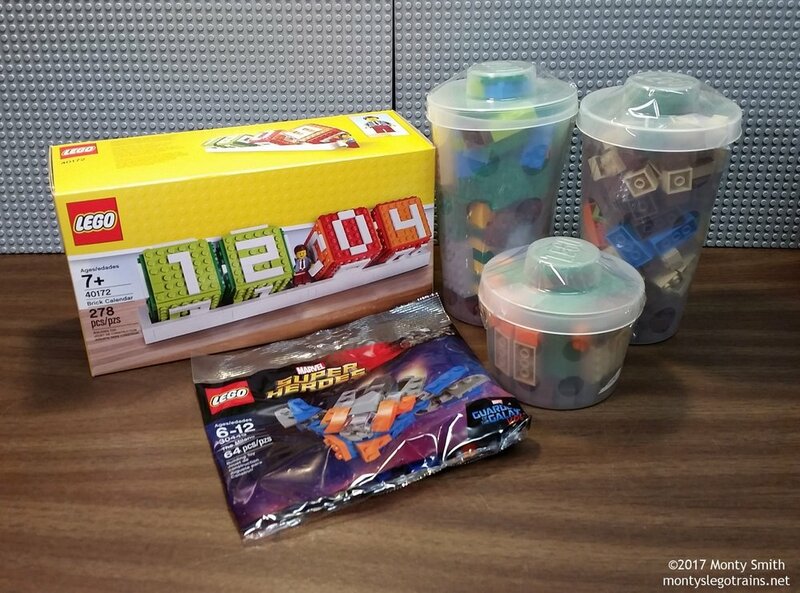 The plastic bags are from two Bricklink orders that arrived on the same day. After rebuilding the round covered hopper (as seen in the previous workshop blog) I found out that the rounded 6x8 top & bottom slope pieces came in several other colors, as can be seen here and here. So, through quite a few Bricklink orders (given that many sellers only had one or two of each piece; the gray one took 5 orders by itself just to acquire the round bits!) I acquired several other colors and got building. Six new freight cars to kick off 2017! Two boxcars, two covered hoppers, a gondola and a flatcar. More pictures of how they were each built are shown below! As stated on my railfan blog, I'm rather embarassed that I haven't updated this in several months, but I was working 7 days a week through the end of 2016. Now in 2017, I'm back down to three jobs instead of four, so I now have PLENTY of time to spend in the workshop building things. Below are samples of each new freight car I've built so far, and there's more to come! First on my to-do list for 2017 was to finally start rebuilding my fleet of covered hoppers. I had slated my existing set of 11 colorblock covered hoppers for scrapping for quite a while, but simply hadn't had the inspiration on how to replace them. I finally found the spark in the "6x6x2 inverted quad slope with cutouts," piece, thinking to myself that it looked a bit like a bottom bay door on a covered hopper. A bit of research showed that this piece was available in several colors, all of which would look great on a hopper car, so a prototype was immediately constructed and additional parts ordered! I picked up a few sets of Lego Salt and Pepper shakers, as I thought they would make an interesting flatcar load. This changed to a gondola load after being inspired by an item in the MTH O Scale catalog. I built the sides of the gondola using hinged plates, and added ladders to both sides of both ends to keep the vertical plates (held together with a second layer of tiles and details) from looking too wide. I also added a road number by using vehicle license plate stickers (eventually all my rolling stock will have ID markings) and some blue and white tiles for a makeshift logo on the end. I've had a Big Red Boxcar sitting on the "works in progress" shelf for a couple of years. I built it quite a while ago, but it ended up being just a bit TOO big to run smoothly on my railroad. This weekend, I finally got it out of the half-completed-projects bin and completely rebuilt it. I added a license plate road number, a LEGO logo, handrails, brake lines, non-functioning running rails for the doors, and yellow safety stripes across the bottom. After building the Big Red Boxcar, I wanted to do another boxcar, and I had a lot of green pieces sitting in my parts drawers... but I didn't want to to just another colorblock, so I opted to try out a "weathered" look using the different shades of green available. It didn't come out BRILLIANT, but there's always the option to rebuild! Another type of covered hopper I've had in my collection for a while is a rounded covered hopper using parts from set 3180. It was a bit of a rush job, and I always had the thought of rebuilding it... and then I found out the rounded upper and lower halves were available in several other colors. So, like my tank car train, I plan to have copies of this same car design in a few different paint schemes. For a prototype model to compare with, click here. Nearly all of these builds took place in one weekend, and right before I went to bed before going back to the work week, I thought "wait a minute! I don't have a basic brown flatcar!" 20 minutes later, I did. Used two 6x8 and a 6x12 plate for the frame, then gave it a second layer of different shades of brown for a worn/used look. Added an underframe, some trucks (spaced one stud apart) and a steering wheel (later changed to a tool wheel) for the "brakes." Probably should add some brake piping underneath as well. Look forward to seeing updated versions of these cars in the near future, and as always, thanks for reading! Now that I have a trio of excellent-looking Alcos to power my brick hopper train, I realized the caboose assigned to that duty was a bit... lackluster. I had styled it after a Lionel design, which was a rather cheap/crude model, and my L scale version reflected that. So, I scrapped the unsatisfying slant-cupola design, and proceeded to use the bits to form a red-white-&-blue striped standard-cupola caboose to match the Bicentennial Apache unit. This build only took about an hour and a half, and might have been shorter if I hadn't made a couple of errors. Enjoy the pictures! The RS-11 is one of my all-time favorite locomotives. I already have one built from Lego bricks, a chop-nose LTV mining workhorse in yellow and maroon. While aimlessly browsing for Bicentennial paint schemes one night, I came across the top image of an Apache Railway RS-11 in a glorious red, white & blue. Despite already having an RS-11 as well as another Apache Railway ALCO (a C424 in green and white) I simply *HAD* to build one of these patriotic high-nose units! The Apache Railway is a 72-mile line between a now-defunct paper mill at Snowflake, Arizona, and an interchange with BNSF at Holbrook, Arizona. The bulk of the railroads traffic came from the paper mill, and in the wake of the paper mill closing, several local business owners saved the railway from bankruptcy. The railroad is currently surviving on freight car storage and repair for income, while the new owners seek out additional customers to serve by rail. The railway has primarily operated only American Locomotive Company products, save for two H10-44s from Fairbanks Morse. The RS-11s were bought secondhand from Southern Pacific and were operated in groups with RS-36s purchased new, all of which were painted in the bold paint scheme of red on the bottom, white stripe in the middle, blue across the top, with white trim. The RS-11s featured extra headlights and a mars light, likely as-ordered originally by Southern Pacific, and the Apache Railway has kept that design choice for their current fleet of ALCO C420s and C424s, all of which are painted in green and white. While the railroad was transitioning from RS engines to Century series engines, the railway briefly used a light-blue on silver paint scheme. This means that technically, the red white & blue painted units never operated with green and white units, but modelers license with the qualifier of "it looks cool" wins out! Despite using my existing Lego RS-11 as a template, this build was rather challenging. Several times I had to take apart lots of brickwork to solve a problem with the color striping, and I made modifications to the LTV engine to better match the prototype, and to ensure that the units were as identical as possible, save for the height of the short nose. I came up short on grill bricks in the appropriate colors, so some green grill pieces are used on the engineers side of the locomotive until the correctly colored parts arrive in the mail. I took the creative liberty of adding the extra light arrays to both ends of the locomotive so I can operate it Long Hood Forward. My Lego Apache C424 is currently assigned to the multicolored brick hopper train with the LTV mining RS-11, and this new RS-11 will join them. They will be run alternately in pairs, and occasionally as a trio with an extra-long train. I'm also considering a matching caboose, but that's a project for another day. Please enjoy the gallery below of the building process, all steps are captioned and explained, and look forward to seeing this engine hauling hopper trains on my layouts! For my first Lego workshop blog post, I decided to stick to the simple things and build a basic brown boxcar. I've been hoarding brown bricks for months in preparation for this build, in both the new #192 "reddish brown" and the older #25 "brown." While the official shade of "boxcar brown" varies from railroad to railroad, I was only planning on building one boxcar. I initially thought about building the car with a "speckled" look, mixing the older and newer browns for a weathered appearance. This idea was finalized after I saw a forum post where a user had painted an HO scale blue Golden West boxcar with a shade of fresh turquoise patched across the bottom, as though it had been used to mask graffiti. Using my sand-green boxcar as a template, I set to work. Though building from the bottom-up is the norm, I realized that I wanted to use the new reddish-brown along the bottom of the car, and the older brown on top. Given that I had a much smaller supply of the old brown, I decided to start with the old brown from the roof down, so I could use every last piece of it before merging it with the new brown. Thankfully I double-checked my work, and found that the rail plates (to represent the sliding rack for the boxcar door) were aligned to opposing ends. An easy fix job, and quite soon both ends of the boxcar were done! While the color-merging plan had come out well, I wasn't entirely happy with the blandness of the sides. Most boxcars have reporting marks as well as railroad names or logos, and so should mine! I briefly considered using white bricks or plates built into the side of the walls, but no pattern seemed like it would be convincing. Finally, I dove into my supply of decorated tiles, and came up with a pair of 2x2 white tiles decorated with the Explorien logo, a space theme from the mid-1990s. To build the tiles into the wall, I used 1x1 "lamp" bricks, mounted on interior wall reinforcements, with a 1x2 and 2x2 plate behind the tile itself. To cover up the exposed studs underneath the sideways tile, I "underlined" the logo with a blue tile on one side and a silver tile on the other. Depending on which one I end up liking more, I may eventually make both underlines the same color. Unfortunately I didn't find a 1x2 decorated tile that seemed fitting to appear as reporting marks, and using a blank tile or white brick below the flashy Explorien logo seemed inappropriate. Something for the Bricklink shopping list then! The doors use more SNOT techniques, to mount a 6x7 plate array on each side to appear as the sliding doors of the boxcar. After the final assembly of the carbody, I turned to the undercarriage and trucks. The wheelsets are spaced one stud apart to fit a 1x6 plate with round 1x1s representing truck springs, and then spaced one stud away from the coupler assemblies to give a smoother ride. The bars-with-stop-rings represent brake pipes, with the grille brick and stacked 1x2 plates giving a busier look to the seldom-viewed underside of the freight car. With this done, I then modified both boxcars with additional door details. I am also considering trying a more textured roofline, but that's a project for another day!